The best world news to come in a long time is today’s vote by the Greek parliament, ratifying the so-called Prespa agreement and putting an end to the name dispute between Athens and Skopje. As of today, the official name of what Greece used to call FYROM is the Republic of North Macedonia, and this Balkan country can now finally join NATO and start accession negotiations with the EU. In a time of rising jingoism worldwide, the two votes – in Athens, but also the one before that, in Skopje – are giving hope that wisdom can prevail and nationalism can be vanquished. In his country, Prime Minister Zoran Zaev has faced powerful nationalistic opposition, and it was exactly the same for Alexis Tsipras in Greece. Moreover, the big opposition parties in both countries sought legitimacy in their European political family, the EPP, the biggest force in the EU. The EU didn’t occupy centre stage in putting in place the Prespa agreement either, it was a UN-led process. Internationally, the agreement had one big enemy: Russia, who opposes the accession of North Macedonia to NATO. The votes in Skopje and Athens clearly had a geopolitical dimension. Indirectly, they were not only about the future of the Republic of North Macedonia but about the future of the entire Western Balkans. A domino effect following a negative vote could have destabilised this fragile region. Now, at least with respect to the NATO accession of North Macedonia, the point of no return has been reached. The EU’s role is to make sure North Macedonia opens accession negotiations and that the people of this country realise the benefits of EU membership. It will not be easy: New Democracy in Greece already threatens to put obstacles to the accession process. This political force leads in the polls ahead of the October elections. The EU should make sure that there will be no rollback imposed by Athens nationalists. And that the European political centres would not be accomplices. 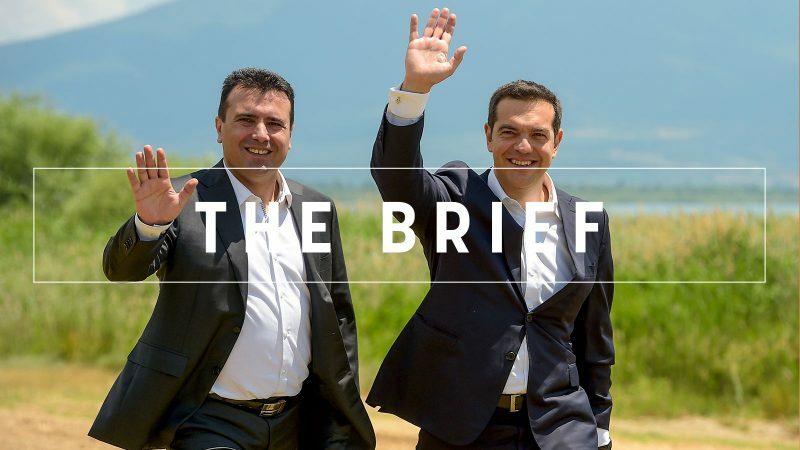 When the Prespa agreement was signed last June, we wrote that anti-system diplomacy works. The stars aligned for this one, as Tsipras embodies a politician who is not responsible for the mess Greece is in, while Zaev is the rarest breed of Balkan politicians, immune to nationalism. Personalities play a role in history. Many years will pass, but the two men on the photo we chose will be remembered. It’s such a rare occasion when the result of the politician’s enormous work becomes plain to see. Zaev and Tsipras deserve the Nobel Peace Prize. The Davos Forum is winding down but lo and behold: a 16-year-old Swedish climate activist took the stage to warn world leaders that their successes come at “unthinkable price tags” for the rest of the global community. George Soros, meanwhile, told the Davos crowd that absentee US President Trump should focus on tackling China, whose President Xi Jinping is “the most dangerous enemy”, and recommended a “crackdown” on its tech giants ZTE and Huawei. Ukraine believes that Russia has no interest in finding a compromise in the EU-mediated Ukraine gas transit talks and is using energy as a lever to weaken Kyiv in a bid to deepen the country’s annexation. Only a few weeks away from the nuclear arms control treaty (INF) withdrawal deadline set by Trump, Washington has offered to hold arms control talks with Russia. Trump’s privacy ombudsman nomination, who is meant to oversee the EU-US privacy shield agreement, ‘is not a concession’, the EU concluded. Better late than never: Unlike other political groups, France’s LREM is allowing itself until March to reveal who will lead its list for the European elections. Donations to German parties, it appears, soar during elections. Critics argue that these donations distort democracy. The sharing economy could kill two birds with one stone by lowering the cost of green technologies and reducing polluting emissions. This weeks’ Tweets of the Week features Davos bling that continues to shock, fingers pointed at Elmar Brok, and 10 years meme making us all take stock. European Parliament’s plenary session in Brussels.